Leaving Ibarra behind we set off on a bus for the border. I have to admit that me and M were both a bit jittery about travelling into Colombia, after all, you should read the Foreign Office website; ” The Foreign and Commonwealth Office (FCO) advise against all but essential travel to the following parts of Colombia…there is a high threat from terrorism“. We were going in! Me, being me, I had already approached a couple of backpackers at the bus terminal at Ibarra for a natter and they had the same feelings as us, so we agreed to team up. There is after all, safety in numbers. 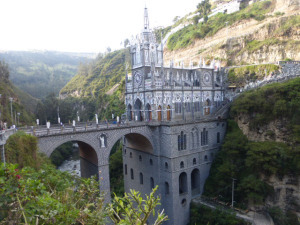 We had to get a cab from the last town on the Ecuadorian side to the border, check out of Ecuador, walk about five hundred meters across a bridge over a river, check into the Colombian side and then get another cab to the closest town of Ipiales. We were all expecting the worst because both me and M had already had some not so nice border experiences (check out this link to see how we fared in Bolivia) and the Dutch couple had also had some hairy border crossings previously. As the four of us negotiated the various stages of the transfer we kept glancing at each other and raising eyebrows and frowning. Something had to go wrong in a minute. There were no screaming, jostling cab drivers trying to scam us and no rogues trying to steal our bags. The border police on both sides were happy and smiley and immigration in Colombia chatted and winked at us. We were all a bit shell-shocked and kept wondering why it was so easy. Walking across the bridge over the river which divided the two countries the experience was the polar opposite of our bridge experience whilst going into Bolivia at Christmas but none of us were complaining. The only explanation that we could think of was that both Ecuador and Colombia are desperate to change their image and want to attract more tourists. Tourism is booming in Ecuador and it has been a great success story, but now that I have been in Colombia for a couple of weeks already, I think it is because the Colombians are the smiliest, chattiest most inquisitive people. You can’t get on a bus in Colombia and expect to keep yourself to yourself. Everybody chats to everybody else and if you are different in any shape or form then even more so. We parted company with the Dutch couple who set off further north whilst me and M went over to our hotel which was directly opposite the bus terminal in Ipiales. To be perfectly honest it was a bit of a dump. We expected a bit of a dive, after all, one of the travel websites warned of the local ladies of the night who would hire rooms by the hour. It was adequate for a very quick visit although the room was freezing cold and the promised Wifi was useless. The staff on the front desk were as grumpy and unhelpful as hell and M wanted to know why on earth we had arranged to stop here, but I had been given a tip off that there was something that we shouldn’t miss close by the town and she should trust me. Setting off to find a collectivo which wasn’t heading back to the border, we journeyed about twenty minutes away from the town. And there was the little gem as recommended by my Russian friend Mishka. Snuggling deep in a gorge and spanning a small river was a bridge. But this was no ordinary bridge. Tall arches propped up a church at one end. And this was no ordinary church either. It was a fairytale castle/church and as the afternoon sun set behind the mountains it appeared to float in the amber light. There was an unusual little museum set deep in the bowels of the building which displayed religious icons. I personally didn’t find the exhibits especially interesting but the location was atmospheric with the brick barrel ceilings and little dark alcoves everywhere. 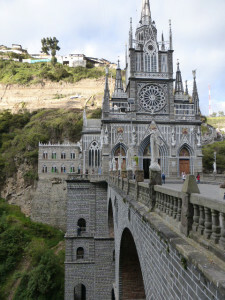 Las Lajas was built on the sight of an eighteenth century miracle and the number of healings here are said to be second only to those at Lourdes in France. The church part of the castle/church was quite beautiful and it was full of people preparing it for Semana Santa. Large flower displays were being fussed over and fairy lights around the altar checked, much like we check our Christmas tree lights when you get them down from the attic every year. The frustration was the same when a bulb failed to light, but to me, it was very odd to watch people deciding whether to drape the lights over Jesus’ ear or not. Back in our miserable hotel (I refuse to name it here and give it any advertising at all) we piled as many blankets onto the bed as we could find and settled down to what was to be a dreadful nights sleep for the both of us. The next day we checked out as quickly as we could and we trudged across the road to find transport to the town of Pasto. Arriving in Pasto with no accommodation our cab driver came up trumps and we found a nice hotel with a private room on what turned out to be one of the main streets. 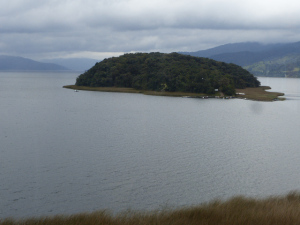 The following day we took a collectivo (shared cab) to the Laguna de la Cocha. During our journey the two ladies that we were sharing with asked if we would like to alter our journey plans slightly and go to another part of the lake and take a boat trip over to the small island with them. Never one to turn down an opportunity to see something else, me and M agreed and we ended up spending the rest of the day with them, although I do have to confess to missing the bit about the boat or I would have questioned them more closely. The boat turned out to be nothing more than a canoe with an outboard engine. These tiny little craft were buzzing around over the surface of the lake (the second largest in South America and weirdly shaped like the continent). I was pleased to see other passengers wearing life vests but then found out our canoe didn’t contain any. Our man was wearing a red poncho and really looked the coolest Colombian but that wouldn’t help him if we ended up in the water, so I wasn’t that impressed. The island was small but quite cute with a boardwalk up through the middle of jungly stuff to the other side. We did survive the boat trip and had a late dinner together with our new acquaintances before heading back to Pasto. We were told that the following night was to be a spectacular lunar eclipse, and if we would like to delay our onward plans by twenty four hours perhaps we might like to watch the eclipse (weather permitting of course) from Lady’s wooden cabin in the countryside. Me and M thought for all of twenty nine seconds about this and decided that yes, of course we would love to accept Lady’s offer so we went back to our hotel to pack our bags once again. N.B: By the way, when revisiting the Foreign Office website for the quote for this blog, I realised that me and M have already inadvertently travelled into, and have come out unscathed from one of the areas which is blacklisted. Oops!! But its Thursday today ! ?